Hartford House in KwaZulu-Natal is one of those rare places which has it all - a picturesque setting, fabulous restaurant and beautifully designed rooms. Situated on the Summerhill Stud Estate in Mooi River, Hartford House has won countless awards for both its accommodation and food. The restaurant is run by renowned Chef Jackie Cameron and the menu is varied and interesting, taking advantage of the region's fresh produce. Be assured that the meals are the kind which people remember for years. Jackie's food presentation is particularly noteworthy with most dishes looking far too good to destroy with a knife and fork but utterly sublime when you do. Meals are served either out on the veranda overlooking the estate's colourful gardens or inside the dining room of the original homestead. The original house is still home to three guest suites which boast period details such as antique taps and light fixtures which many guests find fascinating. Every suite in the hotel is unique and each boasts details which will delight. 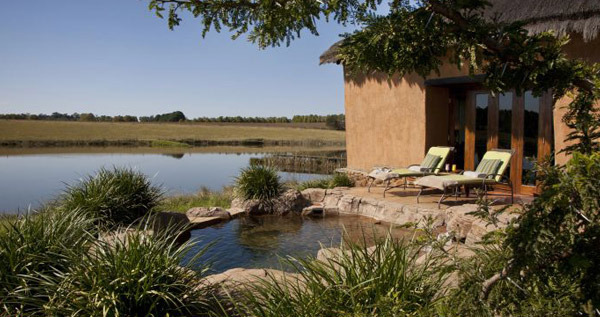 Some suites look out onto the gardens and swimming pool and four recently built eco suites are made entirely from natural materials from the estate and its surrounds. The feel of these suites is distinctly African and there can be no doubt of your location in the world as you gaze out over the lake. The Summerhill Estate is a destination on its own as the leading racehorse breeder in South Africa. Guests are welcome and regular tours of the Stud are conducted. Other activities include trout fishing - I expect my divine trout lunch was freshly caught - and horse riding, bird watching and spa treatments in the wellness centre. The Battlefields and Midlands Meander are also within easy reach and, so, a stay here really should be for more than just one night. The restaurant also welcomes guests who are not resident in the hotel for meals and a Sunday outing to Hartford House for lunch is a rare treat. For more information visit www.hartford.co.za or call 033-263-2713.